Less painful testing in an all-in-one device with six lancets in one drum. Please note the Multiclix lancing device has now been discontinued and replaced by the Fastclix. Both devices use different drums and Multiclix drums are still available to purchase. 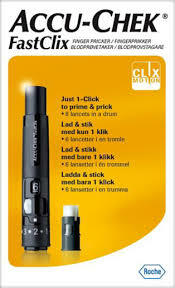 However if you are upgrading lancing devices you will need to purchase new Fastclix drums for this device.